We’ve taken up snowshoeing and cross-country skiing, perfect activities for the ‘outdoorsy lite’ in me. I had no idea I would also come to try — and enjoy — of all things, snowmobiling. I’ve always considered sledding a sport for more adventurous outdoorsy types; young strong guys and gals with more guts and a higher risk tolerance than a 40-something year-old-mother of two. Sure, there’s plenty of high-adrenalin adventurous mountain sledding here, as demonstrated by the steady pageant of sled decks and trailers you see in Golden throughout the snow-filled months. 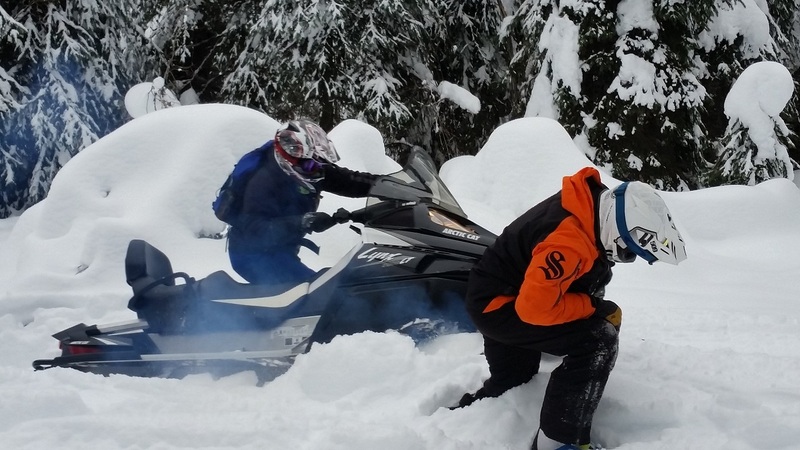 But it turns out snowmobiling is also a great family activity: fun, safe, and super easy to do on Golden’s extensive network of groomed trails. Aaron and Kim are GSR’s owner-operators. They started the company nearly a decade ago and have since expanded to include a retail side, Mountain Motor Sports, which specializes in both sleds and ATVs. They are exactly what you’d expect from a Golden business ‑ family-run, super-friendly, and with amazing customer service and expertise. They pride themselves on keeping their groups small, especially their mountain tours, to ensure maximum enjoyment as well as safety. 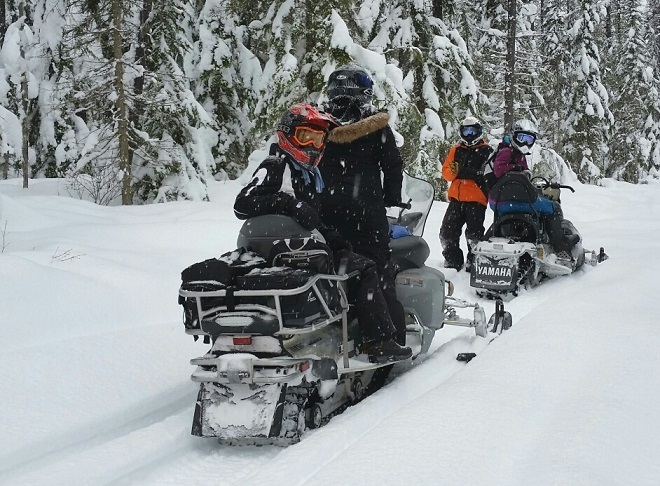 Our half-day tour was the perfect introduction to snowmobiling. We learned how to work the machines played with our speed on the trails and played with maneuverability in soft snow on a lake. We even found time to venture off the groomed trail for a taste of beginner-friendly fresh tracks adventure – along with learning a bit about how to dig out when you get yourself stuck in the snow. Mix that in with a few breaks for snacks and chit-chat, and it adds up to one pretty terrific experience. So much so, I’ve dubbed our day on the Westbench Trail our ‘gateway tour.’ Because now I want to go again. Only this time I want to try the next level, the half-day ‘mountain sledding’ tour so I can try out my skills in more powder and with more varied terrain, but still with the safety of having a guide and the fun of going with a group. So there you have it – snowmobiling as a fun new ‘who knew’ activity that still suits the ‘outdoorsy lite’ in me. Let’s go sledding!